Haworthia truncata var. maughani f. variegata hort. Haworthia truncata f. crassa Poelln. Haworthia truncata f. normalis Poelln. Haworthia truncata f. tenuis Poelln. 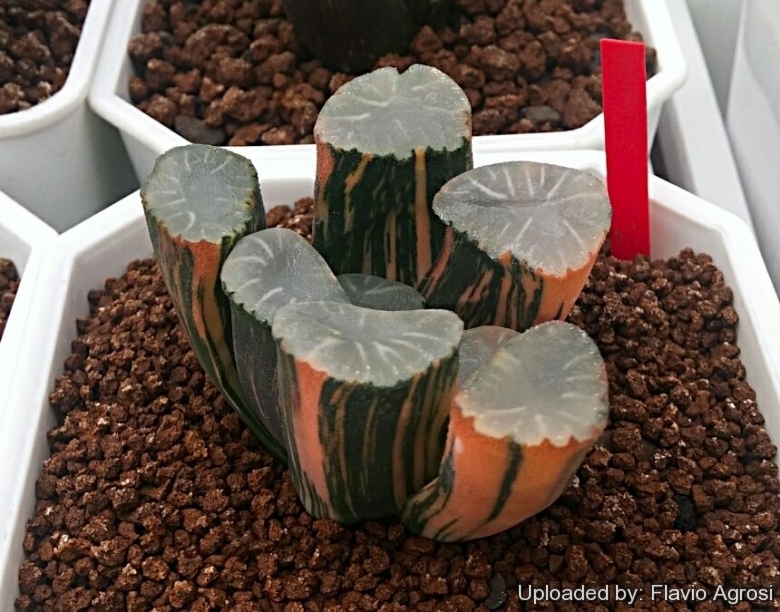 Description: Haworthia maughani is a very variable species with unusual flat-topped stubby leaves windowed on upper margin. Similar to Haworthia truncata it is very wanted in cultivation and has a large potential for hybridizing. Forma variegata: A variegated plant has stripes with two or more different colours, even distinct shades of brownish-green. Plants with variegated leaves are often attractive and highly prized. The leaves are normally dark green, and variegated epidermis is an uncommon mutation, termed a chimera. A chimeral variegation is due to losing the ability to produce chlorophyll in some of the plant’s tissue, so that this tissue is no longer green. Tissues lacking chlorophyll are usually white or pale yellow-coloured (due to carotenoid pigments) or red (due to anthocyanin pigments) contrasting with the normal brownish-green tissue. There are several forms of variegation, depending on the tissues that have been affected. The variegation in some forms is unstable. The extent and nature of the variegation can vary, and sometimes the plant will return to the green form. In others it is stable and does not change under normal conditions. Because the variegation is due to the presence of two kinds of plant tissue, propagating the plant must be by a vegetative method of propagation that preserves both types of tissue in relation to each other. Haworthia truncata Schönland: Stemless distichous plants with unusual truncate leaf tips. The leaves are windowed on upper margin. Haworthia truncata f. crassa Poelln. : Has broader and fatter translucent 'glassy' windowowed leaf-tips up to 4 (or more) cm wide. Haworthia truncata var. maughani f. variegata hort. : has stripes with two or more different colours, even distinct shades of brownish-green. Plants with variegated leaves are often attractive and highly prized. Haworthia truncata var. maughanii (Poelln.) Halda: has unusual abruptly truncated leaves forming an irregular, circular, scabrous leaf-tip about 1-1,5 cm in diameter which can be translucent, opaque or variously veined. Haworthia truncata var. maughanii cv. Murasake: Japanese cultivar veined with red lines on the translucent top. Haworthia truncata var. maughanii cv. Yukiguni: (Snow county) Japanese cultivar with white snowflakes-like design on the top. Haworthia truncata var. minor Breuer: Dwarf form. Haworthia truncata var. tenuis (Poelln.) M.B.Bayer: Has thinner and smaller translucent 'glassy' windowowed leaf-tips. 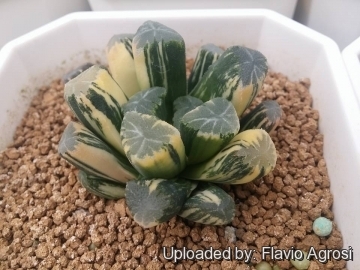 Haworthia truncata f. variegata: Has variegated leaves with creamy-white, yellow and green stripes, and even distinct shades of brownish-green. Haworthia truncata cv. Lime Green: hybrid, characterized by broad fan-like leaves with "semi"-transparent windows, lovely frosted with shades of lime green. The leaves seem to glisten. Notes: Contractile roots pull the this plant deeper into the soil to protect it from sun and heat during the dry season. Contractile roots are found in many plants species mainly at the base of an underground organ (bulb, corm, succulent rosette, etc.) The contractile roots continually pull the plants deeper into the ground as the stem elongates so the it remain subterranean or at an appropriate level in the ground.. Contractile roots are usually broad, fleshy, vertical, tapering, wrinkled looking and very distinct of the rather cylindrical fine absorbent roots and are capable of incredible effort. In most cases, contractile roots not only produce a strong pulling force on but also push away the substratum and create a soil channel in which plant movement is made easier. For example in Haworthia the fleshy contractile roots swell with moisture in the wet season creating a space in the substrate then - after the full drying out of soil during the dry season - a considerable parts of this roots die off leaving empty spaces in the substratum that allow plant movement with minimum or no resistance, at the same time the other roots dehydrates and shrinks vertically, drawing the plant down into the ground. This is repeated early permitting the top of the plant to remain constantly at the soil level. Cultivation and Propagation: Not difficult to cultivate, though it is not fast growing and takes several years to form good looking heads. Haworthias are very responsive to differing cultural conditions both as regards colour, length and shape of leaves, rate of growth and size of plant. Soil: It grows best in sandy-gritty soil and requires good drainage as it it is prone to root rot. Fertilization: Feed it once or twice during the growing season with a fertilizer specifically formulated for cactus and succulents (poor in nitrogen), including all micro nutrients and trace elements diluted to ? the strength recommended on the label. Repotting: Must be repotted frequently, because every year a part of their roots die and then rots in the pot. Needs a deep pot to accommodate the long, thick, contractile roots. Watering Needs: Water regularly in the growing season, but avoid water-logging and let dry between watering, they should never dry out completely during the rest period. If grown in a container, bottom watering by immersing the container is recommended. It must have very dry atmosphere. Sun Exposure: Keep cool and shaded in summer, and provide locations with diffuse sunlight or light shade, it can tolerate shade, shelter from direct sun during the hottest hours. In shade the body colour will remain more green, while full sun will darken a lot. It can be sunburned if moved from shade/greenhouse into full sun too quickly. The amount of sunlight it can withstand without scorching depends upon the how hot it becomes in the summer in the locale in which it is planted. During the spring it may be able to take full sun until the heat arrives at the end of spring. In an area that has hot afternoon sun, it may be able to take full morning sun, but requires afternoon shade or afternoon light shade. Frost Tolerance: Light frost protection required. It requires a minimum temperature of about 5?C (But will take a light frost and is hardy down to -5(-7)? C for short periods if it is in dry soil). USDA zones 9A ? 11. In areas prone to frost, grow in an intermediate greenhouse or conservatory, in pots. Pests and diseases: May be susceptible to mealybugs and rarely scale. Propagation: Seeds, offsetts, leaves and roots cuttings. Leave the offsets that appear at the base between the leaves attached to form a cluster, or wait until they are 1/3 the size of the parent and then detach and plant. Cuttings root easily and remain true to the species, while seeds tend to hybridize.